Here at Cellardoor we're quite partial to some vintage shopping, so we were delighted when stumbled across this little gem. 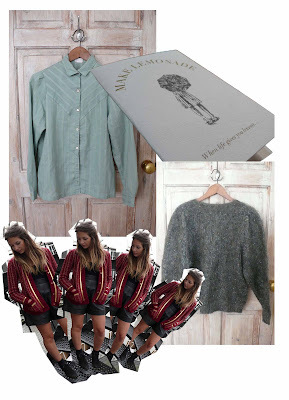 Make Lemonade Vintage started just last year and has since grown into somewhat of a online vintage treasure. Each piece is hand-picked and sourced from great vintage in London. And if you're keen to keep up to date with catwalk trends, than have no fear because you girls are catered for too, with inspiration from Chloe, Celine and Mulberry. We've spied cute blouses with crochet and silk trimming, which are the brands speciality, as well as the vintage staples such as Levis Cut-off’s and of course the can't-live-without cable knit jumpers. I've completly fell in love with this shop, its adorable! I've got my eye on the white peter pan collar top and the yellow shirt, plus its so cheap aswell as vintage clothing is usally quite expensive around where I live! Wow, they have some great things, thanks for the tip!